I was so late finishing my sockapalooza socks that I completely forgot to take photos of the finished pair before sending them across the world to Australia and the lovely Rose Red, who, with her love of reds and shoes could be a long lost soul sister. 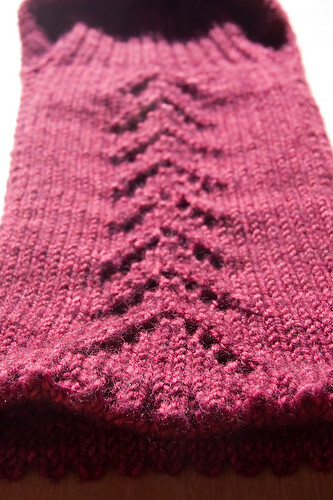 I had great fun reading her blog and finding out about her, and as I did last year, I decided that none of the sock patterns I knew about would do the trick, and set about designing a pair of socks for her. Using Colinette Jitterbug (purchased from I Knit London I followed the basic toe up with heel flap recipe given in Widdershins from last summer's Knittyand began to make my modifications. A subtle eyelet line along the sides of the foot and continuing up the leg, joined by another subtle eyelet line from the heel up, and an arrow lace pattern up the back of the leg (for some reason, I couldn't get the image of seamed stockings out of my head when thinking about socks for her), topped off with a picot cuff. I'm very proud of these, and delighted that she likes them and they fit (always a worry when knitting for other people who you can't make try on things). They look fabulous on her too. A job well done, I think.